Doctor Who lost episodes: now on iTunes, "Enemy of the World" and "Web of Fear" are great. Let’s say your favorite show is Breaking Bad. Let’s say you started watching in Season 3, when Walt’s problems with Gus Fring were really heating up. Well, of course you’d want to go back and see how Walt got into this mess. Now pretend that other than the pilot, every copy of Season 1 was gone. It didn’t exist on DVD, or online, or even in a museum somewhere. You could only experience Krazy-8 in the basement or Walt and Jesse’s methylamine heist through reconstructions from audio or episode novelizations, which—no matter how decently written—can’t possibly recapture the impact of Bryan Cranston’s performance. This is how Doctor Who fans have felt for decades. The long-running British science-fiction series has never been more popular in the United States, regularly topping iTunes downloads charts and scoring not one but two Entertainment Weekly covers. Most American fans have come to the character through the revived version of the series that launched in 2005 and and airs on BBC America. But many fans revere what’s often called “Classic Who,” the lower-budget serialized version that ran on Saturday evenings in the United Kingdom for a Simpsons-esque 26 years, from 1963 to 1989. And fans of Classic Who are freaking out right now, because someone just found Krazy-8 in Nigeria. This past Thursday, the BBC announced that Philip Morris, an executive director at Television International Enterprise Archive, found nine missing episodes of two late-1960s Doctor Who stories at a TV relay station in Jos, Nigeria. Specifically, Morris found parts 1, 2, 4, 5, and 6 of the 1967 serial “The Enemy of the World,” and parts 2, 4, 5, and 6 of the immediately following 1968 story “The Web of Fear.” As “Enemy” part 3 and “Web” part 1 were already preserved, this enabled the BBC to release both as largely complete stories (an audio-and-production-stills reconstruction stands in for part 3 of “Web”), immediately available on iTunes. Wait. Rewind. Missing episodes? We’re talking about Doctor Who, one of the most famous, beloved, long-running programs in television history. Why would there be episodes missing? In our age of easy, pervasive TV completism, when DVD box sets, downloads, and streaming options have made our daily lives a virtual Museum of Television and Radio, it seems insane that if you like a certain show, you can’t just go back and catch up with it from the beginning. Who erased these episodes? And why are they turning up later in Nigeria? This was way before the era of home video, of privately owned VCRs, of continuity-obsessed fans collecting box sets. The concept of the “rewatch” was decades in the future. 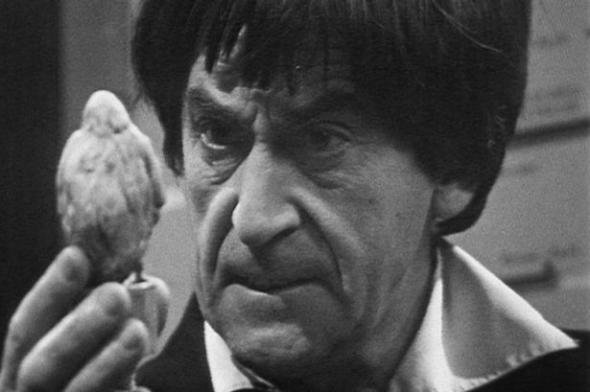 Television was considered a great deal more disposable, and Doctor Who was particularly disposable: Saturday tea-time filler, a silly programmer with bug-eyed aliens. BBC personnel at the time would have been astounded to know that they were deleting anything anyone would miss in 2013. In an engrossing story in the March 2012 issue of Doctor Who Magazine (yes, there’s a Doctor Who magazine), Richard Molesworth (author of Wiped! Doctor Who’s Missing Episodes) chronicles what would turn out to be the saving grace of Doctor Who’s heritage: sales to foreign markets. Through the efforts of archivists and highly motivated fans, an enormous number of these deleted episodes were tracked down in overseas television stations, private collections, fairs, even the backs of cupboards. By the time the iconic Second Doctor story The Tomb of the Cybermen was returned to the BBC by a Hong Kong-based television company in 1991, the number of missing episodes had dwindled from 253 to 110. Episode recovery slowed down considerably after this, and fans would have to wait until 2011 for the next semi-windfall, a single episode from the 1965 First Doctor serial “Galaxy 4” and another from the Second Doctor serial “The Underwater Menace.” Recoveries had gotten so few and far between that the BBC even went so far as to offer a full-sized Dalek to anyone who turned in a missing episode. * That is, until Phillip Morris’s discovery in Nigeria brought the number of remaining missing episodes down to 97—finally, mere double digits! Some of us Classic Who fans have waited our whole lives to see “The Enemy of the World” (a terrific globe-trotting thriller in which Patrick Troughton does double-duty as the Doctor and his villainous double, the futuristic dictator Salamander) and “The Web of Fear” (the serial that introduced viewers to arguably the most important supporting character of the classic series, Brigadier Lethbridge-Stewart). Now that we can finally see them, we’re taking advantage: Both episodes are already iTunes bestsellers. We’re about six weeks out from November 23, 2013, the 50th anniversary of one of the longest-running and most widely loved television series of all time. The anniversary will be simulcast in 75 countries around the world. Among those millions of viewers will be many who watch it and think, “I’ve got to re-watch this from the beginning and see how we got here.” This recovery just made that more possible. And that’s worth freaking out about. Is This What the New Doctor Who Will Be Like?